OPEN ALL YEAR! Kayaks! PONTOON BOAT! gameroom! WATERTRAMPOLINE! For your Fall Color Tour, Cozy Family Thanksgiving, Holiday & Winter Ski Getaways, Spring Break, and Summer Vacations!! Near Traverse City, and Skiing, Crystal Mt, Homestead, Mt Holiday! 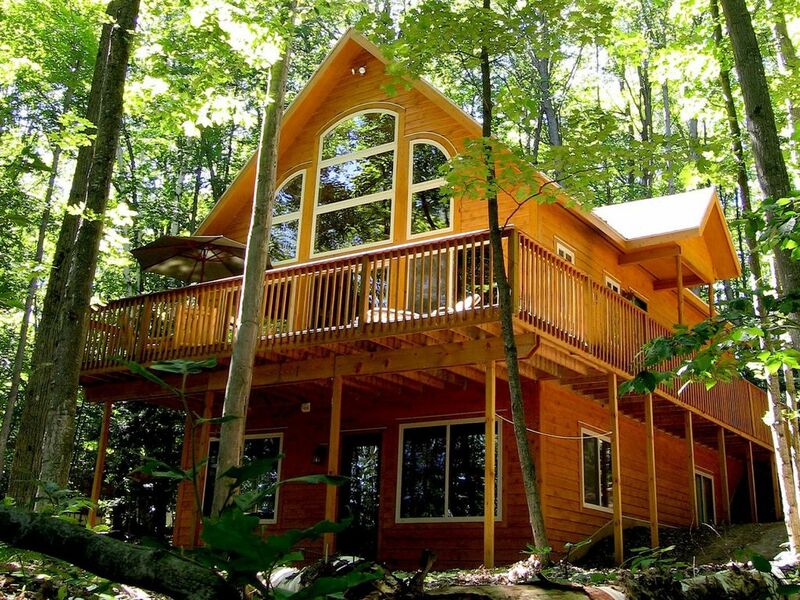 This lodge style home is nestled amidst towering hardwoods and features fantastic views of Cedar Lake. Watch the wildlife roam through the yard on your 100' of private frontage on Cedar Lake. Off the beaten path yet right in the center of one of northern Michigan's most desired vacation destination spots. This Northern Michigan Lodge is located 11 miles west of downtown Traverse City. You're only minutes from such areas as Empire, Sleeping Bear Dunes, Glen Arbor and Old Mission. Come and experience the best that Northern Michigan has to offer. Cedar Lake Lodge (A Northern Michigan Lodge) is open year round and offers a wide variety of activities for every season. I have managed Blue Lakes Vacation Rentals in Traverse City for over 14 years. This home is unique in that it is only a few miles from downtown Traverse City, yet it is surrounded by a local nature conservancy. This means that you'll feel like you're really getting away from it all while you're very close to town. Free pontoon boat, water trampoline, kayaks and paddle boat. Pontoon boat (Memorial Week thru Mid October), Water Trampoline (Memorial Week thru Labor Day Week), 2 Kayaks (May thru October), Row Boat (April til it snows), Swing Set w/ sand box. Awesome place to stay. Had a great weekend. Beautiful and clean. Lots of room for us and our 10 guest. So glad you had a great stay, it is beautiful during the winter and you are welcome back anytime! Sorry to hear you couldn’t get the gas log stove to work. When you mentioned it to us after you had checked out, we went right over to see what the problem was. Someone had set the gas valve under the stove to the OFF position. Sometimes people mistakenly turn the gas off to the fireplace when they leave which kills the pilot light. We just had to relight the pilot. For any issues during your stay, we do provide a maintenance phone number in our rental agreement, and in the "Directions to the home” email. The number is also listed on the home’s refrigerator, in the home information booklet, and on our BLVR voicemail message. We give our guests that number so that any issues that arise can be handled immediately. Always feel free to contact us during your stay so we can make sure you have the best vacation possible. Excellent, relaxing home away from home. Our group of 9 women for wine-tasting weekend were all very impressed with the well-maintained property. The instructions and description were very clear so there were no surprises. Thanks so much for giving my family a well-deserved, stress-free weekend. We rented this house in mid April hoping for sun and 50 degree weather, instead we got 10 inches of snow and freezing rain! However despite being snowed in, the house was wonderful. Great amenities and space. Our cars did get stuck in the snow, but Aaron was quick to come out to the house and ask the plow truck to come. Would have been better if the area was proactively plowed/cleaned on the morning of our checkout without us having to call after getting stuck and eventually paying a towing service to tow our cars out. Yikes, what a terrible storm! Thank you for your review - so glad you had a nice time in spite of our lovely “spring weather.” LOL! This storm, named “Winter Storm Xanto”, was absolutely unprecedented and actually deposited almost double the amount of snowfall of any April snowstorm in recorded history! Some areas got as much as 20 inches of heavy, wet sleet and snow (including my home) It even broke my snow blower! Needless to say, plowing services region-wide were completely overwhelmed and schools were closed for two days. The county road that I live on was not plowed for three days. LOL! Also, it certainly is not ideal for anyone to be driving through weather like this. This is why we offered our guests a free night stay to let things blow through, instead of checking out that morning, and driving through the middle of it. Well anyway, I’m glad everything worked out, and everyone made it home safely through the storm. The cabin was great and so was the scenery. Wasn’t hard to find, really close to traverse city. Had all the comforts of home. We are near downtown Traverse City.